~Carol Hargus is the artist and magic maker behind these botanically dyed silk treasures. Carol has been sewing from an early age and is a third generation seamstress. Through her career as an interior designer, she fell in love with textiles, and as she traveled, she experienced the variation and personality of different materials, colors and patterns. Thus, fiber Art became an inherent byproduct of her work in the design industry. Carol has experimented with many methods of fiber art. Throughout her journey of exploring these mediums, she strongly connected with dyeing. This passion coincided with another passion of hers — sustainability. ~Always an eco-conscious person, Carol felt a strong pull towards creating sustainable art. Traditional dyes are full of chemicals which run off into our ocean, and pollute and kill our wildlife. The industry is one of the most wasteful in the world — there are even unnaturally blue rivers in china from the blue jean factories. 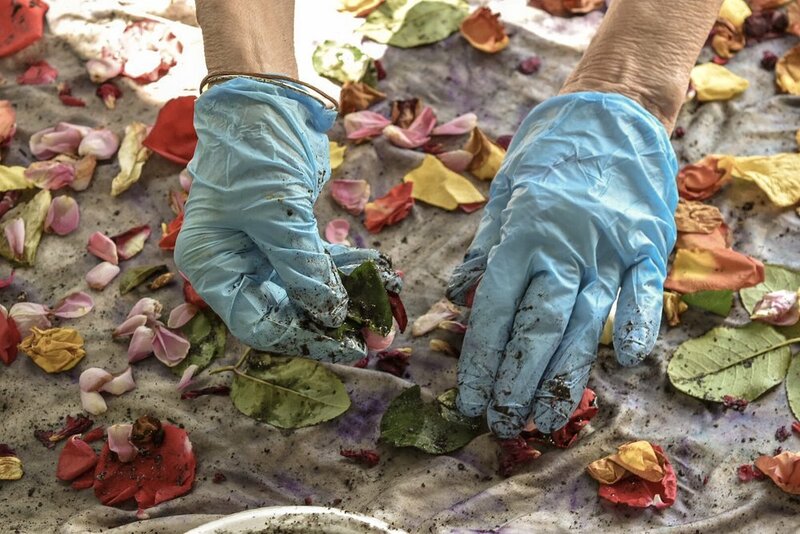 Dyeing with flowers, plant extracts, and food waste produces beautiful results. Carol fell in love with the abstract and kaleidoscopic results she could achieve by merging different natural combinations. ~Stemming from her passion of working with these materials, and her strong values of art and sustainability, Carol began to imagine a vision for a different type of fashion — what is referred to as “slow fashion,” which means sustainable, ethical, and artisan wear and goods. That vision became a mission, and along with it also came the mission of guiding people to a place re-connecting, re-centering, and grounding to the natural world — therefore enhancing their connection to it. The cycles of nature: Life, Death, Rebirth. These wearable art pieces celebrate that cycle, representing the final stage: Rebirth. In the making of the silk pieces, we flow through each stage of life throughout the creation process. In a sense, it’s a cremation, but through this process we reanimate their essence into a new form. ~The simple, pure beauty of the natural world. The innate wisdom of nature, and all of it’s magnificence. ~Consciously and spiritually recycling nature.